One question that humankind has pondered is what is the ultimate fate of the universe? It’s a question that is difficult to fathom. Imagining no more life, stars, planets, black holes or galaxies. Everything would be gone. 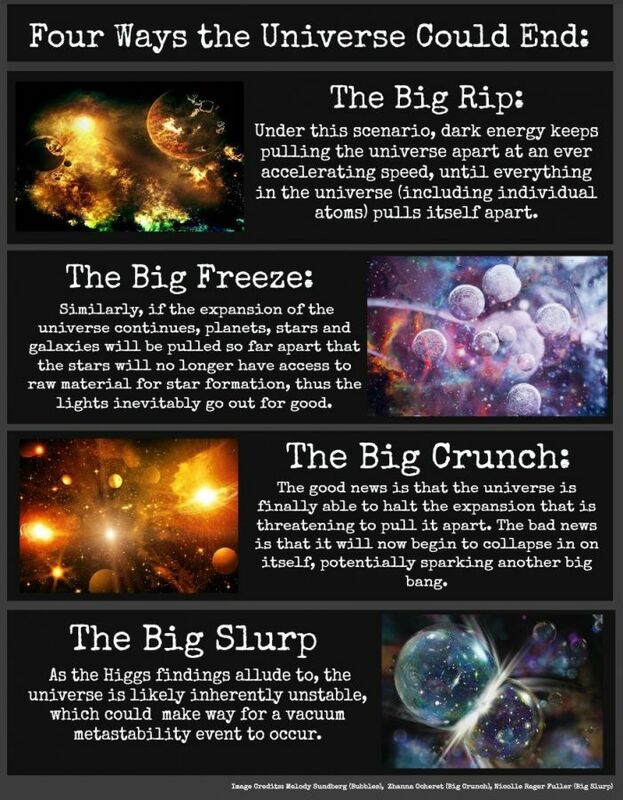 Well there are a few theories on how the universe will end. However, there are scientific theories that actually rival each other because it depends on whether the universe expands infinitely or not. Once the Big Bang theory came into play the question of the ultimate fate of the universe became a valid cosmological question. This all depends on the physical properties of the universe such as mass, energy, average density, and the rate of expansion. 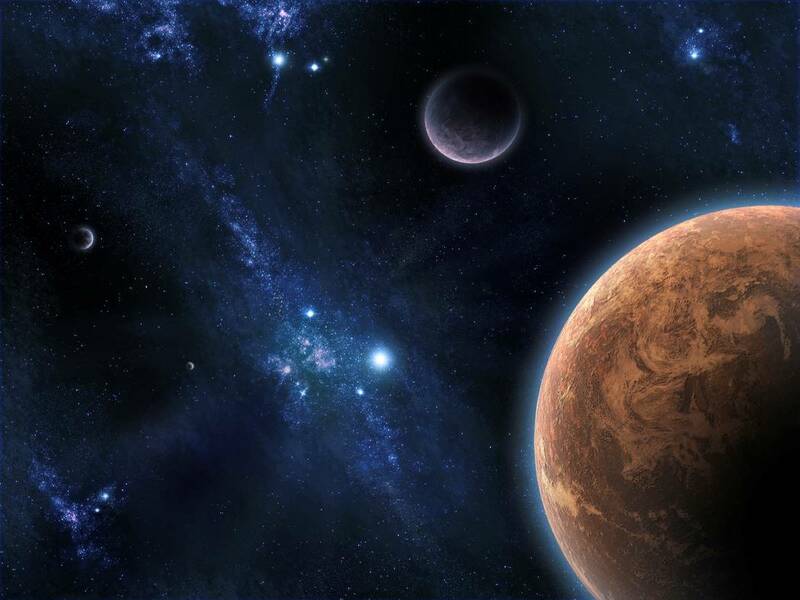 The rate of expansion depends on the Hubble constant (Ho) while the strength of gravity depends on the density and pressure of mass in the universe. Now that we have a better understanding of the factors involved, consider the following: If the pressure of matter is low, like how most forms of mass are, then the universe is governed by the density. If the density in the universe is less than critical density then the universe will expand forever. If the density of the universe is greater than critical density then the universe will collapse onto itself. If the density in the universe is greater than critical density then you will have a sphere shaped universe (Omega > 1). 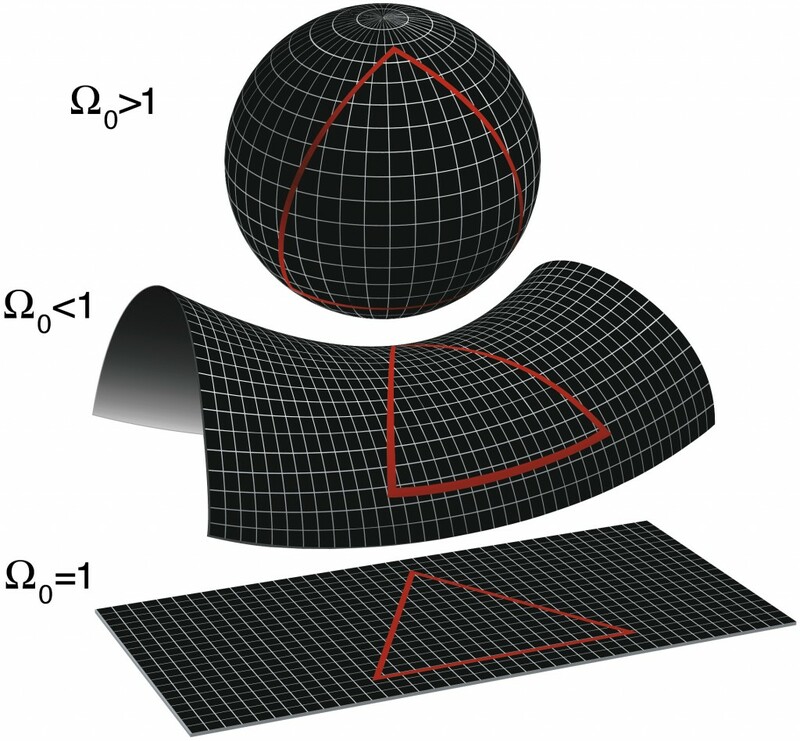 If it is less than the critical density then you’ll have a saddle shaped universe (Omega < 1). In the third scenario if the density in the universe equals the critical density then you’ll have a flat universe (Omega = 1). Now that we have an idea of what a closed universe (greater than critical density) open universe (less than critical density) and flat universe (equal to critical density) look like we can talk about what would happen in each type. In a closed universe there would be a lack of a repulsing effect from dark energy so gravity in turn would eventually stop the expansion of the universe and then the universe would start to contract until all matter collapses onto itself. 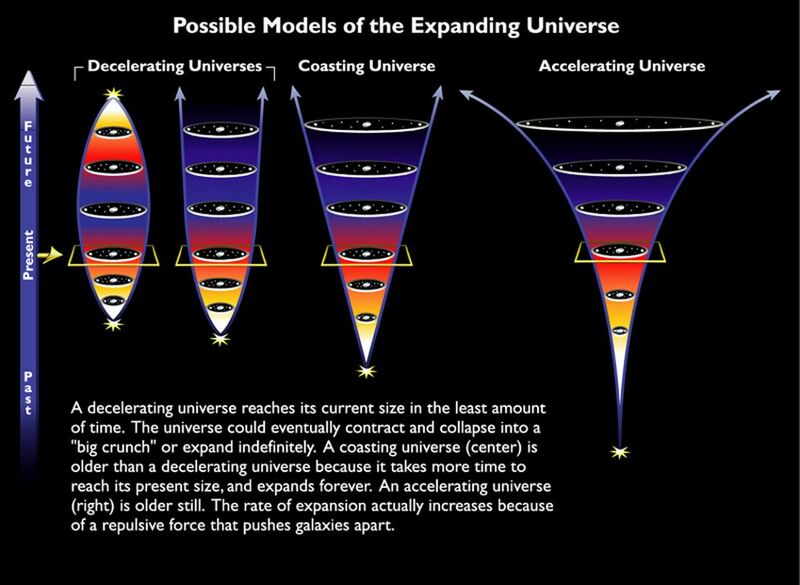 This would end up back to the point of singularity or the “Big Crunch.” However, if there is a significant amount of dark energy then the universe can continue to expand forever, even if the density is greater than critical density. 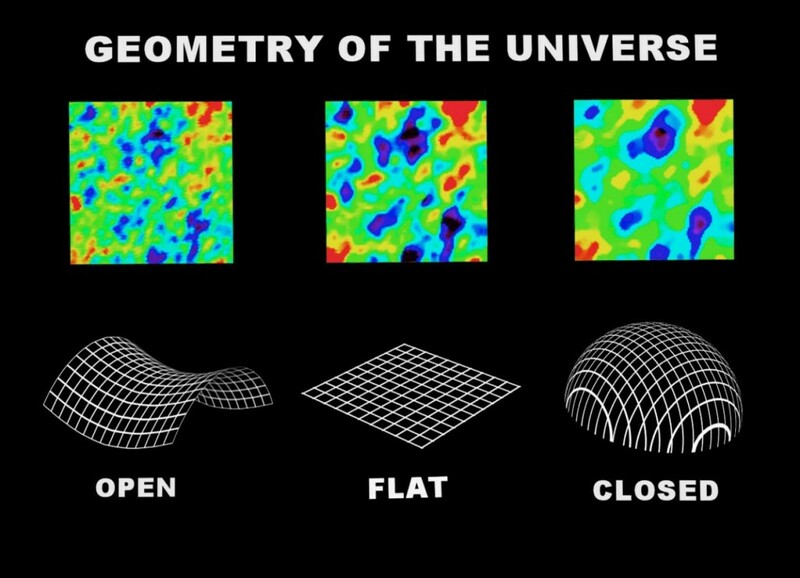 In an open universe a negatively curved universe without dark energy would expand forever. The universe would end in a heat death (known as Big Chill as well), or Big Rip. Basically a heat death is where entropy (or disorder) increases in an isolated system (system = universe). Entropy should never decrease otherwise the universe will be at maximum disorder which is a place you probably don’t want to be. So since entropy is at a maximum and cannot increase any further all the energy gets evenly distributed throughout the cosmos leaving no room for any reusable energy to burst into existence. The Big Chill is similar where the temperature of the universe reaches absolute zero and it would take 1-100 trillion years for a star to form. In the end there would be nothing but black holes which would eventually disappear as well. The Big Rip is a special case scenario or a special case of phantom dark energy. This is where the density of dark energy increases with time causing the rate of acceleration to increase with time. As a result of this, starting with galaxies, all forms of matter will be ripped apart into elementary particles and shooting away from each other. In a flat universe it has the same outcome as an open universe due to the lack of dark energy and an infinite expanding universe. Of course there is also the multiverse theory in which there are multiple universes and there may not be an actual end to the universes as others keep popping up. It’s strongly believed that the Big Chill will most likely be the fate of our universe but of course it might be a difficult claim to prove as we’re not quite there yet with understanding the universe. Finally, for further clarification on the fate of the universe, From Quarks to Quasars created a wonderful infographic on the 4 different ways the universe could end. For more information read the source here or here. What is the ultimate fate of the universe? Well that depends on the density of the universe in relation to the Hubble constant. Click through for more info. Mr. Husain – I was wondering how much TIME would pass before the close-ended Decelerating Universe goes into the Big Crunch? I was also wondering at what point in TIME the open-ended universes would hit the “point-of-no-return” (if there is such a thing) and continue to expand?